192 p. : col. ill. ; 17 cm. by Lewis Carroll ; with illustrations in colors. With Tenniel's illustrations, in color. 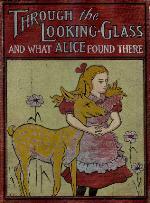 Bound in maroon cloth with an illustration of Alice and a deer on front; cover title in silver. Though envious years would say "forget." was all meant for its good. kitten running after its own tail in the middle. kiss to make it understand that it was in disgrace. with her, and began winding up the ball again. Kitty, we'll go and see the bonfire to-morrow." rupt me!" she went on, holding up one finger. ing up all your punishments for Wednesday week. Suppose they had saved up all my punishments!" kitten. What would they do at the end of a year? in the autumn, when the leaves are getting brown. I'm a hungry hyeena, and you're a bone." and folded your arms, you'd look exactly like her. drawing-room, only the things go the other way. glass, and then they hold up one in the other room. me through the glass in here, and can't get at me! " "They don't keep this room so tidy as the other,"
ders: but in another moment, with a little "Oh!" "Here are the Red King and the Red Queen,"
to see what would happen next. that she knocked him over among the cinders. began scrambling wildly up the side of the fender. he was covered with ashes from head to foot. the table by the side of her noisy little daughter. the ashes, "Mind the volcano! " the most likely place to find one. the regular way-don't get blown up!" .. J i i,, ) . let him drop upon the floor. "Oh! please don't make such faces, my dear!" see if she could find any water to throw over him. could hardly hear what they said. turned cold to the very ends of my whiskers!" "I shall never, never forget! " make a memorandum of it." I don't know," she said to herself. glass, the words will all go the right way again." ', ",;'.. .. -: "
finished it, "but it's rather hard to understand!" killed something: that's clear, at any rate--"
it twists! It's more like a corkscrew than a path! doesn't! This goes straight back to the house! she ran against it before she could stop herself. end of all my adventures! " found herself actually walking in at the door. a house for getting in the way! Never! " "I wish you could talk!" "It isn't manners for us to begin, you know,"
more, she'd be all right." "what else is it good for?" "But what could it do, if any danger came?" "It could bark," said the Rose. "that's why its branches are called boughs!" towards Alice, "or they wouldn't dare to do it!" tongues, I'll pick you! " the pink daisies turned white. hear the way they go on! " none of the flowers could talk." the Tiger-lily. "Then you'll know why." don't see what that has to do with it." "It's my opinion that you never think at all,"
the Rose said in a rather severe tone. for it hadn't spoken before. if you were a bud! " girl in the garden somewhere! " "Well, she has the same awkward shape as you,"
"I daresay you'll see her soon," said the Rose. "She's one of the thorny kind." too. I thought it was the regular rule." "wonderfully fine air it is out here." should advise you to walk the other way." had been so long aiming at. "I don't know what you mean by your way,"
thinking what to say. It saves time." "the next time I'm a little late for dinner." pared with which this would be a wilderness." the top of that hill--"
you'd call that a valley." know. That would be nonsense--"
walked on in silence till they got to the top of the hill. hedges, that reached from brook to brook. men moving about somewhere-and so there are!" other, they began to run. she cried: "Faster! Don't try to talk!" kindly, "You may rest a little now." time! Everything's just as it was! " "A slow sort of country!" said the Queen. naturedly, taking a little box out of her pocket. Alice thought it would not be civil to say "No,"
nearly choked in all her life. ing little pegs in here and there. "Thirst quenched, I hope?" said the Queen. of five, I shall go! " Humpty Dumpty. But you make no remark?" "I-I didn't know I had to make one-just then,"
toes when you walk-and remember who you are! " hurried on to the last. "just as if it was a regular bee," thought Alice. though the idea quite took her breath away at first. and the elephants did tease so! " jumped over the first of the six little brooks. alone is worth a thousand pounds a puff! " worth a thousand pounds a word !" I know I shall! thought Alice. the window and went away. doesn't know her own name! " back from here as luggage! " "' She must be labelled Lass, with care,' you know." number of people there are in the carriage!" train herself the rest of the way," and so on. every time the train stops." Indeed I shan't! Alice said rather impatiently. to her ear : something about 'you would if you could,' you know." from the unhappiness of the poor little creature. friend, and an old friend. And you won't hurt me, though I am an insect." wouldn't be quite a civil question to ask. hand, which happened to be the Goat's beard. went on, as quietly as if nothing had happened. "I like them when they can talk," Alice said. "None of them ever talk, where I come.from." come from? the Gnat inquired. "I never knew T:hem do it." Gnat said, "if they won't answer to them?" do things have names at all?" ing off the names on her fingers. bush, you'll see a Rocking-horse-fly, if you look. swinging itself from branch to branch." and then she went on. Gnat, "and there you'll find a Snap-dragon-fly. "and it makes its nest in a Christmas-box." its head is a lump of sugar." Weak tea with cream in it." posing it couldn't find any?" she suggested. want to lose your name?" you wouldn't have to go, you know." name, she'd call me 'Miss! as the servants do." Why do you wish I had made it? Alice asked. "It's a very bad one." tears came rolling down its cheeks. still so long, she got up and walked on. only way to the Eighth Square. ing to find the creature that had got my old name! people lose dogs-' answers to the name of "Dash: "
thing you met 'Alice,' till one of them answered! If they were wise, they wouldn't answer at all." I know it begins with L! " at all frightened. "Here then! Here then!" stood looking at her again. "What do you call yourself?" the Fawn said. answered, rather sadly, "Nothing, just now." "I'll tell you, if you'll come a little further on,"
the Fawn said. "I can't remember here." into the air, and shook itself free from Alice's arms. another moment it had darted away at full speed. ought I to follow, I wonder?" and they point different ways." from the one marked DUM." to be looked at for nothing. Nohow! " "Contrariwise," added the one marked "DEE,"
Tweedledum: "but it isn't so, rohow." as it isn't, it ain't. That's logic." ting so dark. Would you tell me please? " shut his mouth up again with a snap. shout out, "Contrariwise! and so he did. two hands that were free, to shake hands with her. other, like fiddles and fiddle-sticks. it a long, long time!" music stopped at the same moment. "I hope you're not much tired? she said at last. out of the wood? " eyes, and not noticing Alice's question.
"' The Walrus and the Carpenter is the longest,"
The sun was shining- "
you please tell me first which road-"
"' It was so kind of you to come! "That was mean!" Alice said indignantly. so many as the Walrus." to where the King was sleeping. "Isn't he a lovely sight?" said Tweedledum. what do you think he's dreaming about?" Alice said, "Nobody can guess that." sort of thing in his dream "
"I shouldn't!" Alice exclaimed indignantly. what are you, I should like to know? " if you make so much noise." "I am real! said Alice, and began to cry. shouldn't be able to cry." "I hope you don't suppose those are real tears?" dark. Do you think it's going to rain?" "But it may rain outside? " brella, and seized her by the wrist. finger at a small white thing lying under the tree. to hide himself under the umbrella. his voice rose to a perfect scream. a fish than anything else," Alice thought. dum said in a calmer tone. us to dress up, you know." rugs, table-cloths, dish-covers, and coal-scuttles. these things has got to go on, somehow or other." dee, "to keep his head from being cut off," as he said. one in a battle-to get one's head cut off." "Well-yes-a little," Alice replied gently. "And I've got a toothache!" said Tweedledee. thinking it a good opportunity to make peace. see-when I get really excited." often, I should think," she said. dledum, "if it hadn't been a new one." "I wish the monstrous crow would come!" quick. It's getting as dark as it can." fast it comes! Why, I do believe it's got wings! " their heels and were out of sight in a moment. under a large tree. "It can never get at me here,"
here's somebody's shawl being blown away! " "I'm very glad I happened to be in the way,"
timidly: "Am I addressing the White Queen?" said. "It isn't my notion of the thing, at all." pinned it there, but there's no pleasing it!" said with a sigh. "And I lost the comb yesterday." astonishment. "I never heard of such a thing!" one's memory works both ways." "What sort of things do you remember best?" "Oh, things that happen the week after next,"
finger with a bit of ribbon. wouldn't be all the better his being punished." Queen: "were you ever punished? " "And you were all the better for it, I know!" ing her hand about as if she wanted to shake it off. "My finger's bleeding! Oh, oh, oh, oh! " I soon shall-oh, oh, oh! " feeling very much inclined to laugh. groaned out: the brooch will come undone directly. the way things happen here." holding her hands ready to put over her ears again. glad whenever you like! " ness two large tears came rolling down her cheeks. -how old are you? " dred and one, five months and a day." "I can't believe that! said Alice. "Can't you?" the Queen said in a pitying tone. said: "one can't believe impossible things." breakfast. There goes the shawl again! " succeeded in catching it for herself. "I've got it! " see me pin it on again, all by myself! " what had happened at all. Was she in a shop? at last, looking up for a moment from her knitting. "I don't quite know yet," Alice said very gently. at the shelves as she came to them. were crowded as full as they could hold. through the ceiling, I expect! " were quite used to it. like a porcupine every minute! " pair of knitting-needles as she spoke. answer, so Alice said nothing, but pulled away. fast in it, and would hardly come out again. cried angrily, taking up quite a bunch of needles. were full. "Feather, I say! " asked at last, rather vexed. "I'm not a bird!" "Oh, please! There are some scented rushes!" really are-and such beauties! " ping the boat for a minute." leave off rowing, it'll stop of itself." it would, till it glided gently in among the rushes. other of the darling scented rushes. place, and began to arrange her new-found treasures. to find herself still in the boat. "Are there many crabs here? said Alice. what do you want to buy? " timidly. "How do you sell them?" "Fivepence farthing for one-twopence for two,"
a surprised tone, taking out her purse. "Only you must eat them both, if you buy two,"